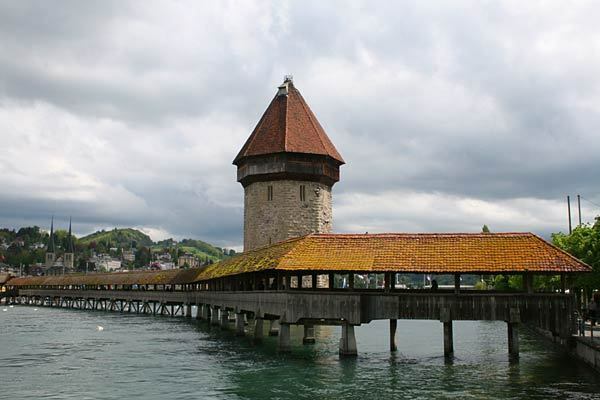 Despite centuries of wear and even a fire, Europe's oldest wooden bridge continues to charm tourists in Lucerne, Switzerland. The Chapel Bridge, which cuts diagonally across the Reuss River, was built in the early 14th century. About 300 years later, the bridge was adorned with a series of triangular paintings depicting events in the city's history. In 1993, fire nearly destroyed the bridge. It was largely restored in 1994. The Chapel Bridge rises beside an octagonal tower that predates it by about 30 years. The tower has been used as a dungeon, torture chamber and archive. Much of the existing bridge dates back to the 1990s because a fire destroyed a large part of the original structure. Despite this, it remains one of the city's most popular attractions. Tourists can still see some of the charred remains of the original bridge. The bridge originally featured 158 paintings from artist Hans Heinrich Wägmann. Before the fire, 147 works survived. Remains from 47 images were collected after the fire, and 30 were restored.